West Bromwich Albion have signed young midfielder Scott Allan from Scottish Premier League club Dundee United. The 20-year-old has moved to The Hawthorns for an undisclosed fee after passing a medical on Monday. United had already agreed a fee for the midfielder with Albion, despite interest from Rangers and Celtic. "The completion of the deal at this time was beneficial for both the player and the club," United boss Peter Houston told the club website. Despite having made only seven first-team appearances for the Tayside outfit, the midfielder has attracted the attention of several clubs. "I think it's great to have attracted such an interesting young talent from just north of the border," said Albion boss Roy Hodgson. "He will be a very good addition to our squad. This is not just a player we're bringing to help for the next four or five months. "This is a player that we think, in the next few years, will be an important player for the club." Rangers boss Ally McCoist had also been chasing Allan's signature, while, in September, Celtic manager Neil Lennon admitted that he was keeping an eye on Allan's development. His deal at Tannadice was due to run out in the summer, at which point United would have received a compensation fee of about £300,000. 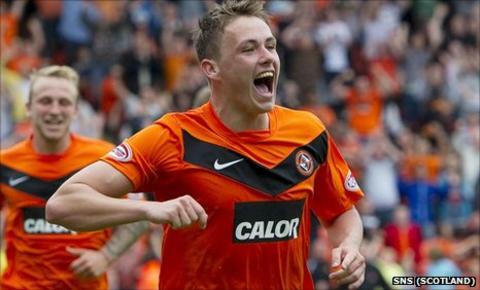 The Scotland Under-21 international was offered a contract extension at Tannadice, which he turned down. Dundee United manager Houston said that, in making that decision, the player had been advised poorly, adding that he was "nowhere near ready" to leave.